It’s fall and that means the weather will be changing. With that said, it is a good time to go a little maintenance on your car. One of the easiest things you can do to help maintain your vehicle in excellent running condition is replacing your battery. How easy is car battery replacement? What kind of batteries are there in your vehicle? There are several different ways to figure out which car battery you should get. The following steps may seem easy and mundane, but they are some of the most overlooked steps as well. It’s good to review. First, you probably should learn what size battery is recommended for your particular make and model. You can search online, but you can always check out your car’s owner’s manual. Inside the manual it will usually tell you details of what battery size you should buy. If you can’t locate this correct manufactures suggested information then you can talk to one of the service representatives at DePaula Chevrolet. We can help you determine the correct battery you should have for your car. Next, it is important to have the correct size and type of battery. Everyone has slightly different driving needs and you really should get a battery that is specific to what you need. You need to remember that things like driving style, weather, and temperature can change the type of battery you should get. You also need to be concerned with the actual physical size of the battery. For example, group size. Group size is actual outside dimensions of the battery. It also is important in determining the placement of the terminals. If you happen to get a battery that is too small, it won’t fit tightly in your car and can cause problems down the road. Another thing to consider is the internal temperature of your engine compartment. Have you ever felt your engine right after you turn it off? Those hot temperatures are hard on those batteries. Inside the battery is an electrolyte solution. If there is a lot of heat in the engine those electrolytes evaporate more rapidly. That means your battery will become more weak over time. Batteries can get old. A big tip is to make sure that you have a fresh battery. One that isn’t too old. Did you know car batteries have a “born on” date? It’s a date stamp that gives you a lot of information about the freshness of your battery. Let’s decode the numbers. So, look for the first 2 characters. Usually, they are a letter and a digit. A is January, B for February, etc. ; the digit specifies the year the battery was manufactured–10 stands for 2010, 13 for 2013. So a date code of A–15 means that the battery was made in January of 2015. It is best to get a battery that hasn’t been on the store shelf longer than 6 months. Those “cold cranking amps”. A lot of people get confused by this. Let’s explain. So, there are two terms to be familiar with “cold cranking amps” (CCA) and “cranking amps” (CA). If you live in a colder area these terms are very important. CCA is all about the batteries ability to start a car in 0 degree F (-17 C) temperatures. CCA explains the amount of current the battery brings to the car’s starter. Finally, CA tells you how much current your battery has when temperatures are 32 degrees F (0 C). Next, we move to talking about the reserve capacity. This is important mostly for older vehicles that might be prone to and alternator failure. The reserve capacity give you how many minutes the battery will have on its own power, in case your alternator does fail. The higher the number, the longer you have power on your own. Finally, look for maintenance free (sealed) and low maintenance batteries. Maintenance free batteries do not need to have water added to them. But, if you are in a very hot climate you may want to consider low maintenance batteries that allow you to refill them with water. So, there are many different things to consider when buying the best battery for your vehicle. Hopefully, we have gone through a few tips to help you decide. Remember, the service department at DePaula Chevrolet can walk you through all the steps necessary to help you pick the perfect battery. So, now that you have the correct battery, how easy is car battery replacement? In most cases, anyone who owns a screwdriver most likely has the ability to change their car battery. Let’s go through a very basic step by step on how to do this on your own. 1) Make sure you get the proper battery for your vehicle. Speak with one of our service advisors here at DePaula Chevrolet. They will be able to help you determine the best battery for the make and model of your vehicle. 2) Safety first! Make sure your engine is off and open up the hood. Find the battery and remove the negative battery cable. This will be the black cable. Be careful using a screwdriver. Sometimes you can damage the connector. Once you have loosened it, twist and pull up on the end of the cable. DO NOT FORCE THE CABLE OFF! You can damage the cable and that will be extra expenses. If you are worried about damaging the cable, you can purchase a battery terminal puller to help you do the job. 3) Do the same thing for the positive terminal. Yup, you guessed it. That would be the red cable. Remember, do not force this. Doing so can turn a simple job into more expensive and a big headache. 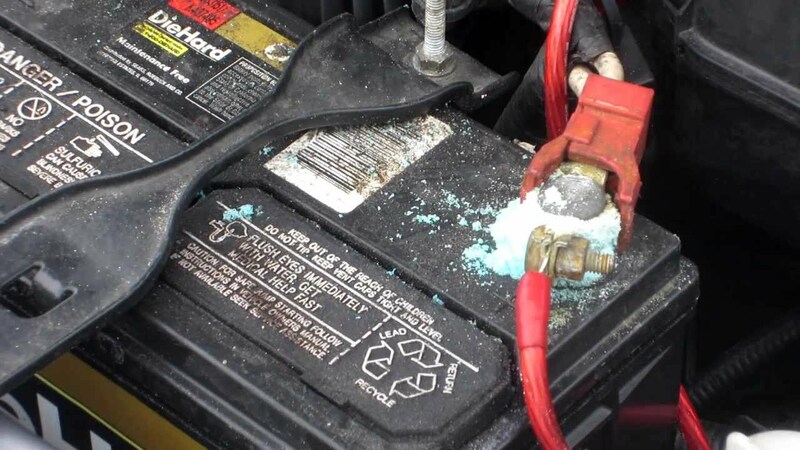 4) Take the battery out of the car. Usually, these batteries will sit in a tray or some form of “holder”. Car batteries can be quite heavy. We recommend that you grab the battery from the bottom. If you are lucky, the battery will have a handle. Definitely, use that if you can. 5) This is a create time to do some preventative maintenance. Battery corrosion can be very troublesome. Clean all the corrosion you can. You can purchase a special battery cleaning solution or use the old standby, baking soda and water mixture. Clean all the corrosion you can from the entire area including the cable and trays. 6) Clean the battery cable connectors with a wire brush. You will find that the heaviest corrosion will be found on the connectors. Sometimes cleaning them is not an enough. 7) At this point, go ahead and place the new battery in the tray. Secure the battery with the hold-down clamp if your vehicle has one. 8) Now is another great time for some preventative maintenance. Spray both terminal ends with the anti-corrosion solution. 9) Now, you can re-attach the cables. Start with the red cable…followed by the black cable. 10) Do a final check and make sure everything is secure and tight. Congrats! You have successfully and properly finished a typical car battery replacement procedure. Crack open a “cold one” and enjoy your new battery!